METAL BLADE • When processing large amounts of meat or vegetables, cut the food into 2cm pieces. • If your are chopping meat or fish, use the PULSE button to control the end result. • For vegetable purées, cut the cooked vegetables into large pieces before putting them in the bowl with the metal blade. Use the PULSE button first, then switch to continuous mode (AUTO) until the purée reaches the desired consistency. BLENDERMIX • Soups, pancake batters, cocktails: the metal blade goes in the bowl first, followed by all the ingredients, then the Blendermix. Your processor is now ready to run. 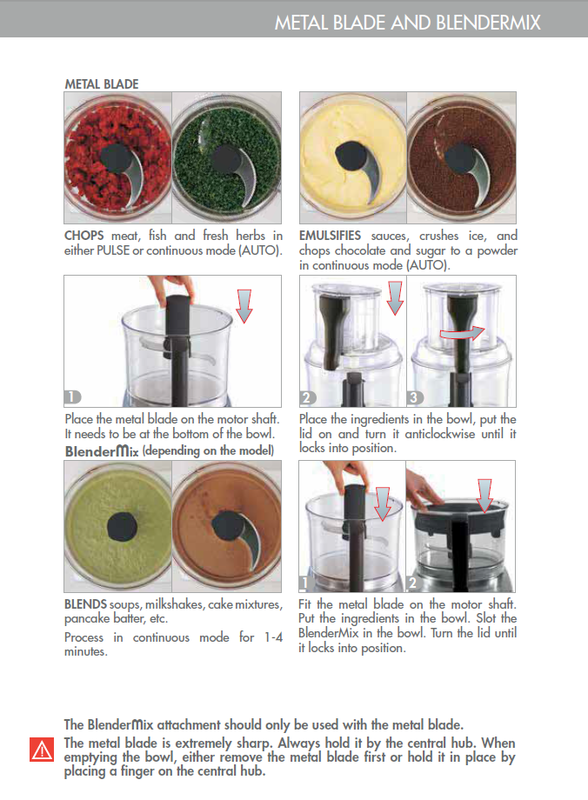 The Blendermix attachment gives a smooth volute finish. DOUGH BLADE • Soft dough (brioche, choux pastry, etc. 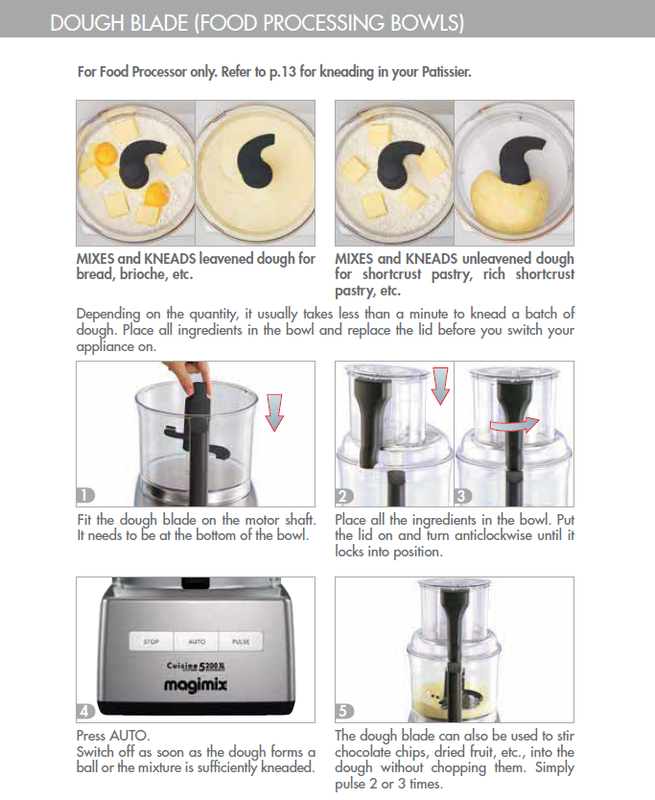 ): Magimix food processors work on the rapid kneading principle. Doughs are kneaded for just 30 seconds to 1 minute, the precise time depending on the amount and type of dough. Follow the instructions carefully for each recipe. • Normal dough: for faster results, leave the dough to rise or prove at (or slightly above) room temperature. As flour is very light, you may sometimes notice a cloud of flour escaping from the bowl. To avoid this happening, put all the non-liquid ingredients (salt, flour, butter, eggs, etc.) in the bowl before adding the liquid ingredients (water, milk, etc.). Only then switch your food processor on. • You can store dough in the freezer for up to 2 months, providing you wrap it carefully in cling film. Remember to take it out the day before you intend to use it. EGG WHISK • Make sure your bowl is clean and dry. 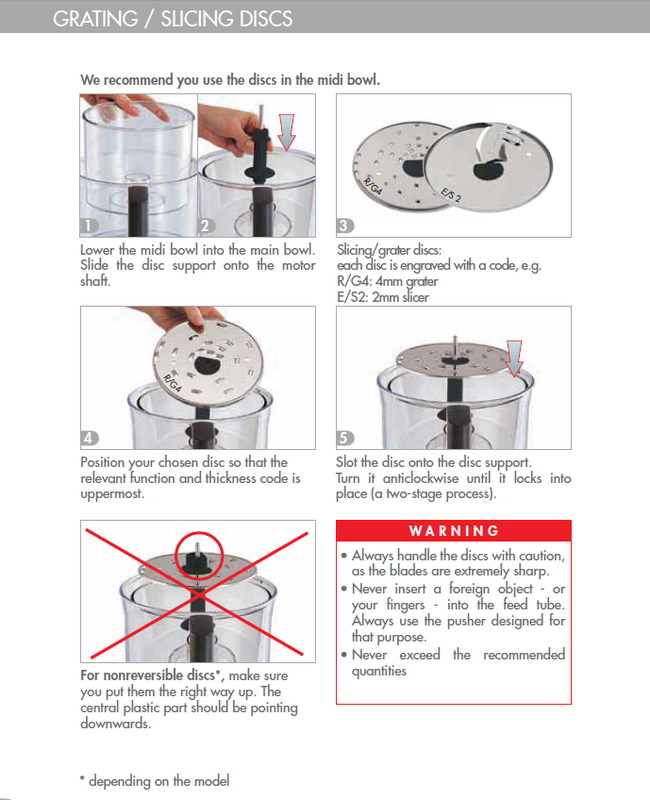 • Remember to remove the graduated pusher from the lid to let in enough air! • Beaten egg whites: for fluffier egg whites, use eggs that are at room temperature.• Whipped cream: do not use fat-free or low-fat cream, as it will not whip! Make sure the full-fat whipping or double cream you use is chilled. Place the food processor bowl in the freezer for 10 minutes beforehand. If you can track it down, add some powdered stabilizer (e.g. 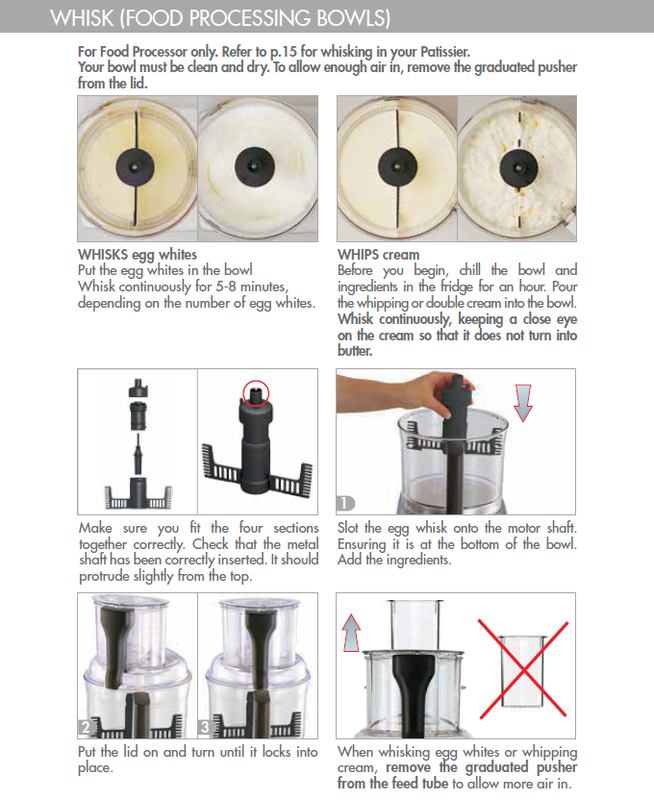 Whip It®) to the cream, as this will keep it stiff for several hours in the fridge. Keep a close eye on the cream while it is being whipped, to avoid over processing and it turning into butter. 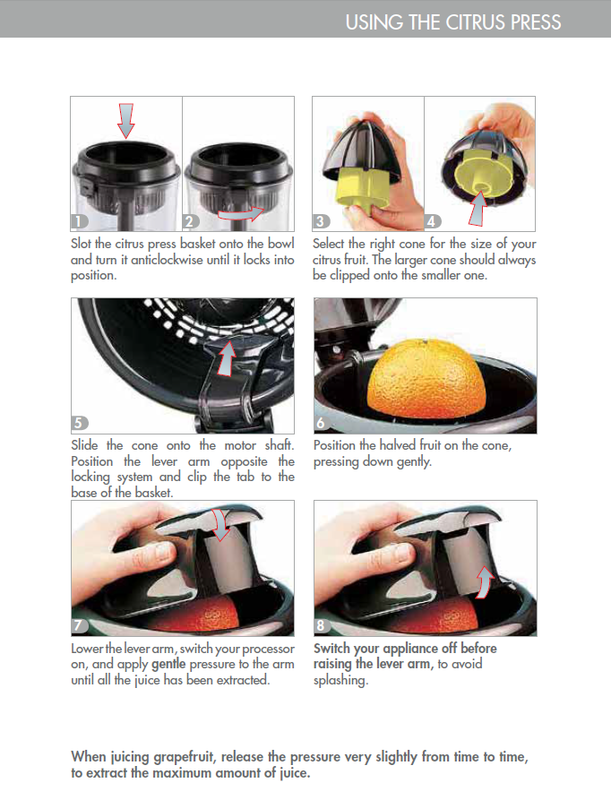 CITRUS PRESS • There are 2 cones: a small one for lemons or limes, a large one for oranges and grapefruits. The small cone is stored inside the large cone. 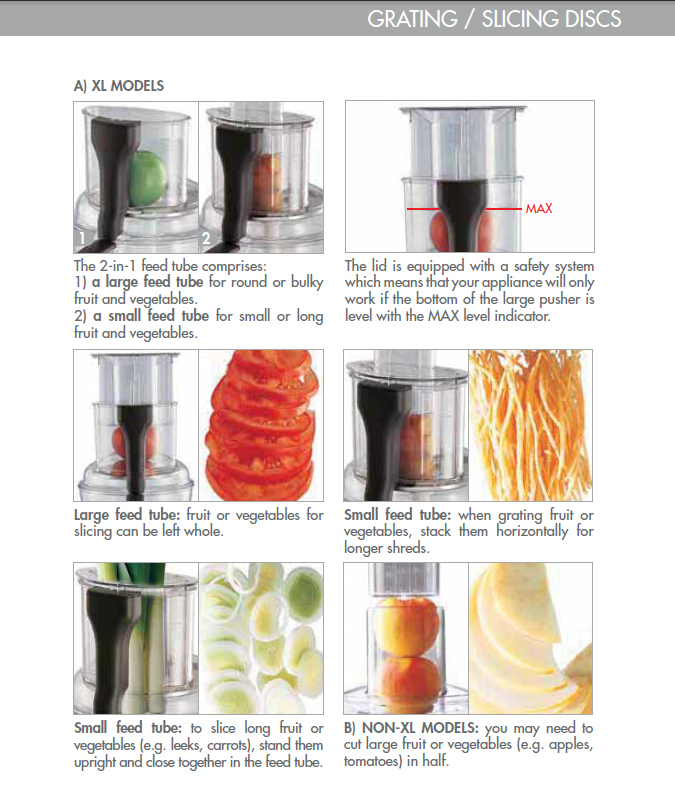 Slicing and grating discs there are many discs available for your Magimix food processor, these used correctly save large amounts of time, julienne carrots can be created in seconds, sliced Cucumbers, Grated cheese, Parmesan, coleslaw and many other jobs quick and cost effective. 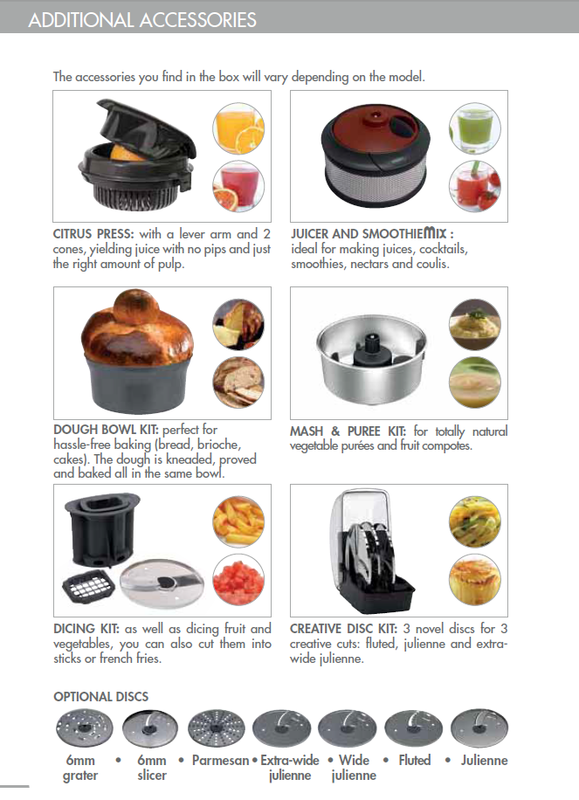 Magimix Accessories there are many accessories available to increase the capability of your food processor, these are easy to use and come with a 3 year guarantee for normal domestic use. Optional Disc are available from BBS ltd.